Is there a word for lying on the bed peacefully, all your muscles relaxed? Is there a word or an idiom for lying on the bed peacefully and happy? Throwing yourself down on bed arms wide open, all your muscles relaxed and staring at the ceiling with a happy smile like something you dreamed of has just happened. Is there an idiom to narrow this situation? There are a few terms which specifically capture the physical state of lying on the ground, face up, but they're fairly clinical and lack the mental overtones you describe (of complete relaxation, etc). 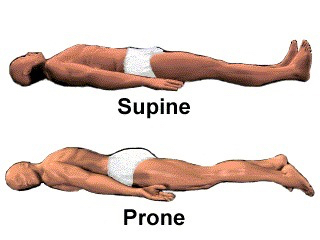 Supine: (of a person) lying face upward. Recumbent: (especially of a person or human figure) lying down. Which I like because it has hints of "recline" and "slumber". As a verb, prostrate¹ often carries an active connotation of laying face down in reverence or submission. Prone: lying flat, especially face downward. spread-eagle: stretched out with one's arms and legs extended. "prisoners are chained to their beds, spread-eagle, for days at a time"
But I strongly recommend you avoid that term. "in repose her face looked relaxed"
But again, that lacks the explicit physical state of laying flat on the floor. So, if you need to capture both the physical and mental states, you can say something like "I was relaxing on the floor", or "I was just floating there" (metaphorically invoking the image of floating on water), or, heck, "I was so relaxed, I just gave myself up to gravity". ¹ Don't confuse prostrate and prostate (with only one r), please. ² Why do I like this particular word? Because I once read a wonderful short story about a living car, and one line the admiring narrator used to describe it was something like "*That car didn't park, it reposed.". Sadly, that's all I can remember of the story; its title is lost to me forever. Though I must admit, neither of these are applied exclusively to describe lying on bed. How about something based on the intransitive verb "loll?" "Sit, lie, or stand in a lazy, relaxed way: 'the two girls lolled in their chairs'" --O.E.D. in a simile, could you use...? Not the answer you're looking for? Browse other questions tagged word-choice single-word-requests phrases expressions idioms or ask your own question. Is there a word for telling someone all your thoughts? Word for “the moment when you feel happy but deep down you are so scared to express that”? An English word for lying without technically lying?